The EU steel industry faces major challenges in the shape of rising prices for raw materials, fierce competition from international producers, and global overcapacity. Niccolò Pisani and Emilio Riva explain that the reaction to these problems has often been to advocate increased market concentration. 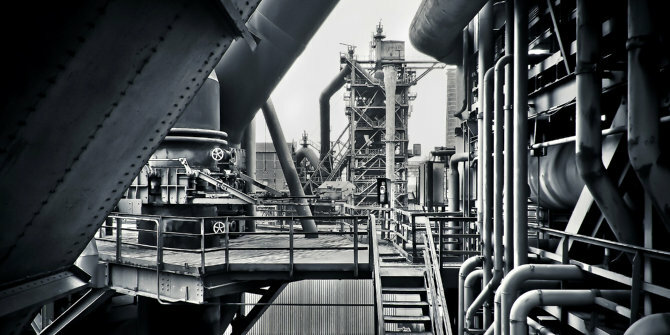 However, the disruptive influence of artificial intelligence and growing anti-globalisation sentiment, epitomised by Donald Trump’s decision to impose a 25% duty on European steel at the start of June, highlight that market concentration may not be the best approach for facing the challenges of the future. There is a widespread belief that many of the problems that have recently plagued the EU steel industry can be resolved, or at least alleviated, by increased market concentration. Aligned with this conviction, many analysts and industry executives have positively welcomed the recent merger of the European operations of Germany’s ThyssenKrupp and India’s Tata Steel. The thinking goes that concentrating EU steel production in the hands of a few large firms will lead to more closely aligned prices in the region, improve the efficiency of their EU plants, and ultimately help the entire sector navigate the troubled waters characterising the last decade. A mature sector suffering from the rising prices of raw materials, fierce competition from international producers, and global overcapacity, mainly due to China’s extraordinary growth, the EU steel industry has been struggling through the doldrums in the recent past. Will increased market concentration help it solve the problems it faces? Will this really contribute to restore profitability and bring the whole sector fully back on its feet? While economists and industry experts would likely tend towards a yes, we identify here two trends that may radically change the landscape of the entire EU steel sector and lead to a very different answer to this question. Decades of empirical research has shown that market concentration is positively related to industry profitability. Economists have long debated why this occurs. On one side of the debate, the advocates of the market-power hypothesis have suggested that the positive profitability-concentration relationship is the result of collusion among the few large players that dominate a highly concentrated market. On the other side, the supporters of the efficiency hypothesis have argued that market concentration is the result of competition, as more efficient firms are able to gain a dominant position in the market and command higher profits. Both arguments seem very relevant when applied to the EU steel industry and its much-awaited greater market concentration. Fewer players will have more power to align prices in the region, respond to new regulations, and manage complex relationships with external stakeholders, especially the unions. At the same time, a greater concentration will imply superior cost-efficiencies and enhanced synergies across plants for the few dominant players in the market. Globally, the steel market volume has grown 41 per cent from 2005 to 2015, yet EBITDA (earnings before interest, taxes, depreciation and amortisation) margins have declined over 55 per cent in the same period. The EU is the second largest producer of steel in the world after China. Even though over 500 steel production sites exist, split between 23 EU member countries, the newly born Thyssen-Krupp Tata Steel and ArcelorMittal will be responsible for nearly 50 per cent of Europe’s steel output. Will further market concentration help the sector in the future? We argue that the following two trends may lead to a radically different answer from the one many would give nowadays. First, artificial intelligence and machine learning may disrupt the steel industry in the upcoming future. While their role in manufacturing and operations is still relatively nascent, scientific experts are beginning to discuss the enormous opportunity to use these tools to fundamentally improve the efficiency and effectiveness of steel producers. Their application will be of interest not only for demand prediction and inventory management, but also for scheduling and production optimisation, predictive maintenance, and outbound transportation. This will allow producers to reach new highs in terms of cost-efficiency and effectiveness, especially those small but more flexible EU steel manufacturers that cannot rely on substantial scale and scope economies due to their relatively small-scale operations. As much as fintech companies are expected to disrupt the banking industry that has been long dominated by few very large players, technologically driven small and agile producers may have the same effect in the steel industry. Second, the anti-globalisation sentiment may disrupt international steel trade in the near future. The heavy tariffs on steel imports recently introduced by Trump have given origin to an international trade fight that will likely turn into protectionist measures to safeguard local steel production across regions. With protectionist policies prevailing, we should expect localised steel production, even at the level of single EU countries, to become central again for national governments. Especially because steel is a strategically important sector that serves national defence projects that may need to be produced at home for security reasons. Thus, if this anti-globalisation sentiment persists, efficiency and market power considerations will likely become much less relevant. EU countries will have a strong incentive to secure a localised presence of steel producers within their national boundaries at the detriment of market concentration in the industry. Will it pay to be large in the EU steel industry? The answer to this question may not be as straightforward as conventional wisdom suggests. Niccolò Pisani is assistant professor of international management at the University of Amsterdam in the Netherlands. He holds a Ph.D. in management from IESE Business School. His research focuses on the international management domain and the topics of his scholarly enquiry range from global business strategy to international corporate social responsibility. His research has appeared in a variety of journals and business outlets. His work has also been published in leading European newspapers such as the Spanish El País and the Belgian L’Echo. Emilio Riva is CEO and founder of Steel Hub in London, a consultancy that boasts a professional team of experienced steel industry engineers and technical experts. He holds an MBA from Bocconi University in Milan. Having served as member of the Executive Board of Riva Group, he is a steel industry leader with a remarkable track record of driving global success in reducing the cost of steel manufacturing and continuous casting processes using state-of-the-art modelling and optimisation techniques in steel plants around the world.